One of the many advantages of working with plywood comes from its inherent dimensional stability. Since the composition of plywood consists of layers of alternating grain direction, any negative effects of wet plywood tend to cancel each other and the board remains, for the most part, straight and level. However, extreme cases of saturation or prolonged exposure to disparate humidity levels often result in sheets of plywood that aren’t perfectly level. How the typical do-it-yourself (DIY) type handles this sort of setback depends largely on a few things: the location of the plywood (has it already been purchased or is it at the home center), the type of defect (cupped, bowed or warped) and the type of work you want to do with it. What follows is a list of some tips to help you handle these cases. If you haven’t purchased the plywood yet and you notice that the stock at the home center is warped, cupped or bowed, it’s normally a good idea to just pass on those sheets—you’re paying good money for them and the dimensional stability they’re famous for. However, and we’ve all done this sort of thing before, you will sometimes store plywood you’ve already purchased is a way that causes it to warp—sometimes you store it with one side subjected to much more humid conditions that its opposite side. Concrete floors are a good example. An extreme example would be storing your plywood sheet, even briefly, on the damp ground while the sun bakes the other side dry. To guard against warping your plywood, if you choose to store it flat just ensure you do so well above the floor and if you have multiple pieces of plywood, make sure you place stickers between these sheets to allow airflow between the sheets. 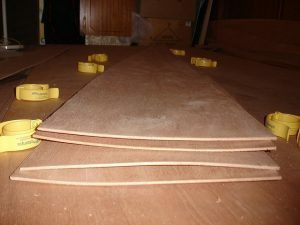 Since not every shop has the space to store large sheets flat, another option would be to store your plywood sheets vertically; again, make sure it’s elevated to minimize moisture absorption along the edges. Normally, if plywood is stored in this manner, slight deformations such as cupping or bowing, will dissipate as the moisture levels equilibrate and the sheet once again becomes dimensionally stable. 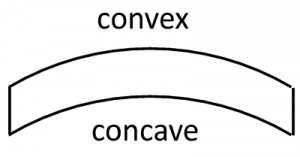 Let’s now assume you have plywood that has cupped— it now has a concave and a convex side. The convex side has had the extra moisture, swelled and expanded. The side that dried out and shrunk a bit is the concave side. See the graphic on the right (exaggerated for clarity). The concave side needs moisture and the convex side needs to dry out. Spray a light mist on the concave side and expose the convex side to sunlight or the drier conditions of your shop, usually facing up. When the two sides reach moisture equilibrium (equal dryness on both sides) the sheet should be flat. This can take a little bit of time, and if you don’t have that sort of time, then using cupped plywood is ok as long as you know its limitations. If the plywood you wish to use is a full sheet with supports for attaching the sheet itself, such as on a roof or flooring where the joists can help flatten sheets when they’re attached, then using slightly cupped sheets of plywood are not problematic. The attachment of the sheet to these supports flattens the sheet and any subtle changes that occur as it dries out are minor. However, there are times when the use of smaller, cupped/warped pieces of plywood is required for a project. These pieces may not have the advantage of an attachment point like a joist to help flatten it. If these smaller pieces of plywood required involve an intricate fit, it would be better to make sure it’s flat before cutting it for use in your project as the piece will eventually equilibrate of its own accord. If a piece is cut while wet or warped, that piece runs the risk of not fitting as well once it does dry out. The take home lesson is that make sure your plywood is dry and flat before you use it for smaller pieces without support to help flatten it. Using slightly cupped or bowed plywood generally isn’t a problem for larger and less delicate applications where the plywood will have time to equilibrate or slight imperfections aren’t detrimental to the overall project. For smaller projects that require the use of smaller pieces of plywood that have cupped, warped or bowed… the best advice would be to restore them to their naturally flat state or consider using pieces that already are flat and straight.